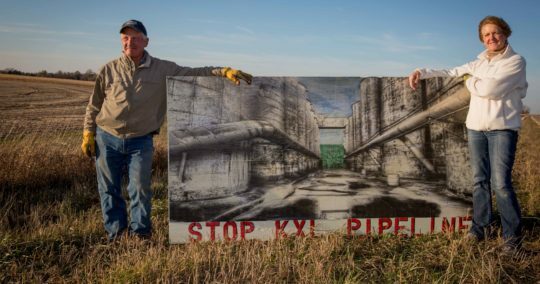 TransCanada’s proposed Keystone XL pipeline would carry 830,000 barrels per day of dirty tarsands oil from Canada through hundreds of American homes, farms and ranches, crossing the delicate Sandhills in Nebraska and putting at risk the critical Ogallala Aquifer and sacred Indigenous sites like the Ponca Trail of Tears. Farmers, ranchers and Indigenous peoples are fighting with everything they have to protect the land and their communities from eminent domain for private gain. 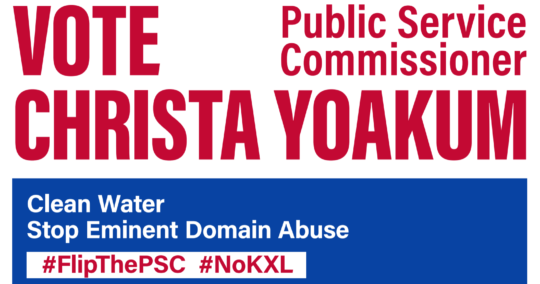 We refuse to allow the Keystone XL to risk our land and water. We have the solutions we need, which is why we’re building solar panels directly in the path of the proposed Keystone XL pipeline. The solar panels will be connected to Nebraska’s power grid, generating clean, renewable energy for the state — as opposed to a risky pipeline that would provide little benefit to Nebraskans. 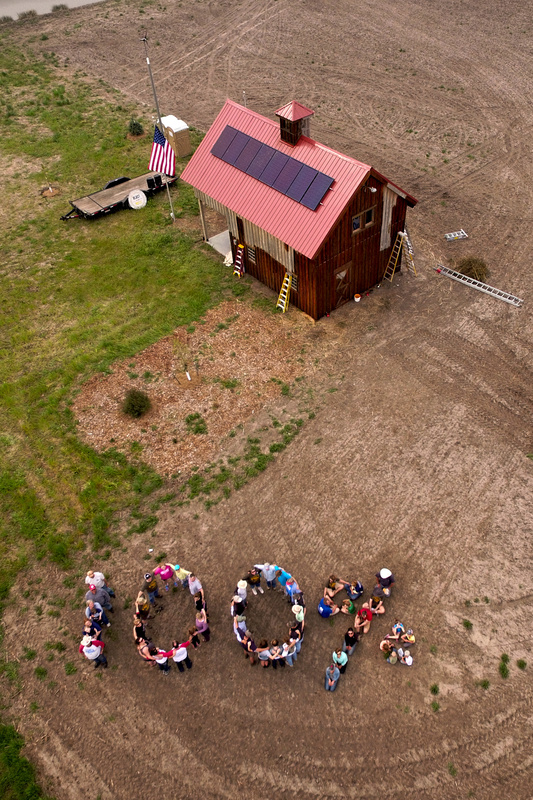 The Carlson’s farm in Polk County will be the site of one of the first SOLAR XL installations. WATCH: Jim Carlson tells MSNBC why he rejected TransCanada’s $307,000 offer to build KXL on his land. Keystone XL would dramatically escalate our climate crisis at a critical time when we must transition away from dirty fossil fuels to clean, renewable sources — like solar energy. That’s why Bold Nebraska has teamed up with 350.org, Indigenous Environmental Network, CREDO, Oil Change International and a coalition of groups to build solar installations inside the proposed pipeline route to help power farms and ranches. 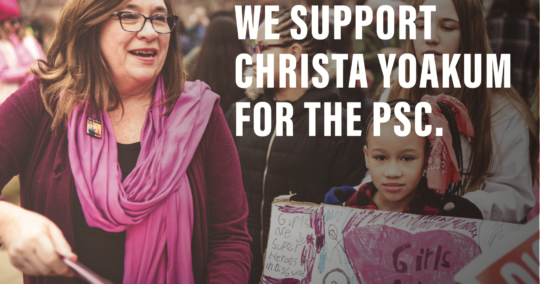 We’re standing up to Trump and Big Oil, who want to trample property rights and risk our water all for their bottom line. The Keystone XL pipeline would cross within 200 feet of the home of Nebraska ranchers Bob and Nancy Allpress, as well as disturb a nearby legally protected bald eagle’s nest the Allpress family has monitored. Any spill from the tarsands pipeline into the sandy soil on the family’s farm would probably leak through to their drinking water source, just 14 feet below the surface. Bob helped lead a horseback cavalry contingent of the “Cowboy & Indian Alliance” of farmers, ranchers, and Indigenous leaders through the streets of Washington, D.C. during the weeklong series of “Reject & Protect” #NoKXL actions in 2014. Bob and Nancy both served in the United States military and came back to the family land to enjoy Nebraska’s Good Life. 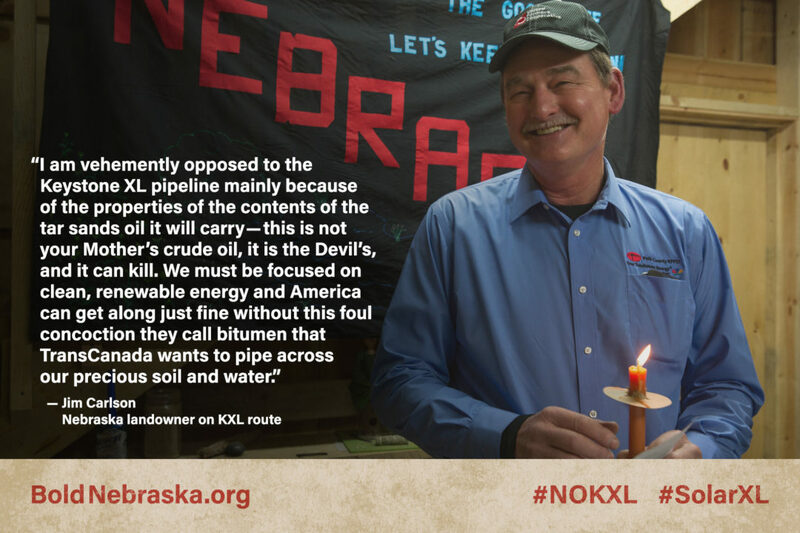 WATCH: Nebraska rancher Bob Allpress talks about why he’s fighting Keystone XL. 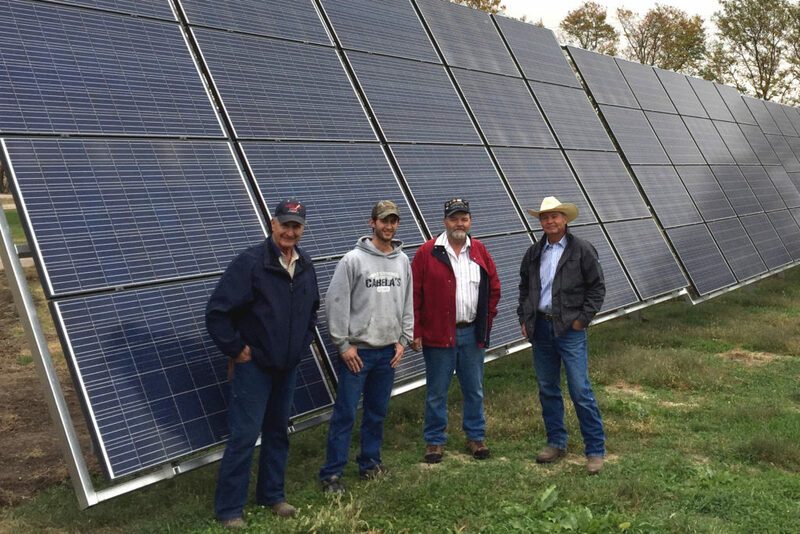 The SOLAR XL project installation work is being done by our friend and fellow Pipeline Fighter Jim Knopik and his family-owned rural solar installation business, North Star Solar Bears. In addition to installing solar on his neighbors’ farms, Jim gives tours of the 15-kilowatt solar panel system on his own cattle ranch and farm west of Fullerton in Nance County, answering visitors’ questions about net metering, cost estimates, incentive grants and tax credits. Jim is also a member of the sustainable meat producing collective North Star Neighbors, a Nebraska Farmers Union District Rep, and has served on the board of the Center for Rural Affairs. If Keystone XL is approved, TransCanada would have to tear down clean and locally-produced energy to make way for its dirty and foreign tarsands. 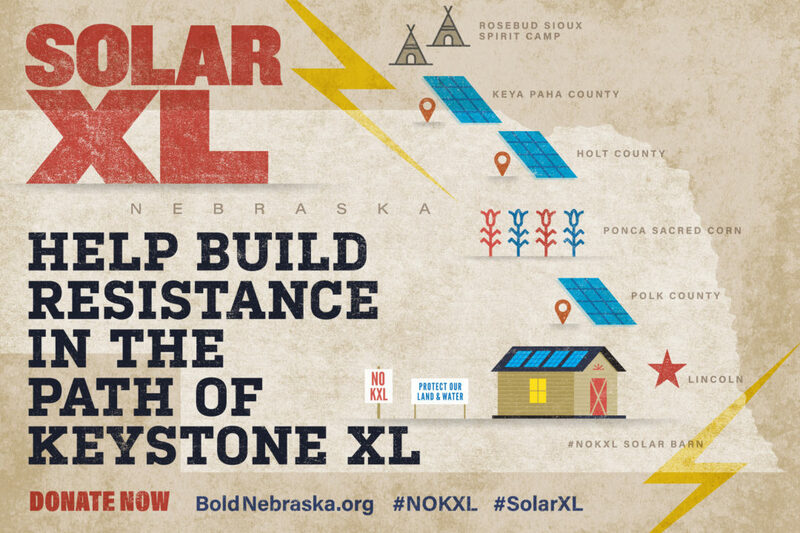 Donate now to build solar in the path of Keystone XL. * COST: $15,500 per installation for 9-panel frame, net-metering connection to Nebraska power grid + labor. 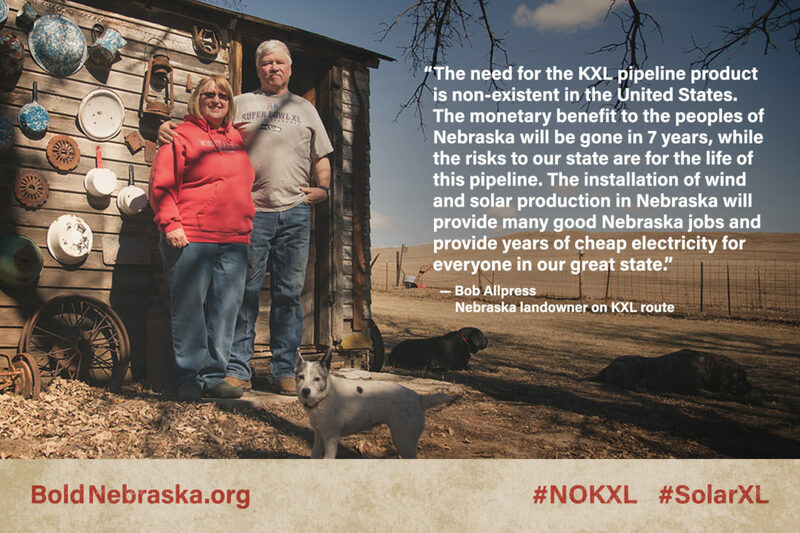 All funds raised in excess of our goal will go to Bold Nebraska to support legal fees for the nearly 100 landowners challenging TransCanada as intervenors in the pipeline permit hearings — our last chance to stop KXL.